On June 21st, 1957, FBI agents raided the Brooklyn hotel room of one “Rudolph Abel,” a foreign national suspected of performing espionage on behalf of the U.S.S.R. That October, “Abel,” a.k.a. Vilyam Genrikhovich Fisher, was convicted on three espionage-related counts and sentenced to 30 years in a federal penitentiary. Three years later, a U-2 spy flight manned by U.S. airman Francis Gary Powers was shot down over Sverdlovsk, U.S.S.R. Captured by Soviet forces, Powers, too, was convicted of espionage, and and sentenced to 10 years incarceration. Two years later, both governments agreed to exchange these captives, and the swap went down on February 10th, 1962, on the Glienicke Bridge, spanning the divide between East and West Berlin. 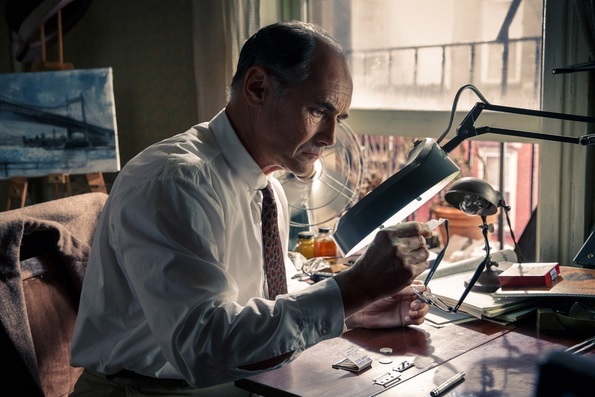 Such is the real-life backstory of Bridge of Spies, Steven Spielberg’s latest feature, which offers yet another of the director’s tailored glimpses into U.S. history. And while Spielberg’s film brings this tale of Cold War-intrigue into the limelight, rather than focusing on the spies themselves, the director and his screenwriting team (led by Matt Charman and the Coen Brothers) have instead built their narrative around Abel’s defense attorney, James B. Donovan. 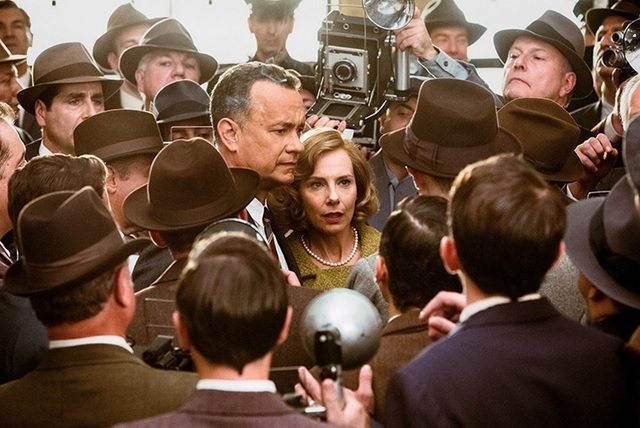 It was he–an unheralded insurance lawyer–who negotiated and secured the prisoner exchange, and who’s portrayed in the film, opening in wide-release tomorrow, by Spielberg veteran and über-everyman Tom Hanks. Insofar as it proves to be a portrait of the power and triumph of simple human decency, Bridge of Spies could be construed as a spiritual sequel to Spielberg’s previous feature, Lincoln. 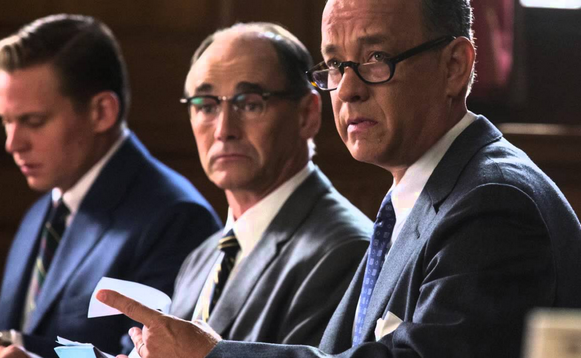 But where that film benefited from its total focus one good man’s efforts in dark times, Bridge of Spies might have been improved if its tone were more reflective of the overall conflict in which it is set, if only to offset the optimism of the forgone conclusion of its plot. Hanks plays Donovon as a morally resolute husband and father with a wry wit, lending the film’s proceedings a steady supply of humor. In full-blown Jimmy Stewart mode, Hanks must navigate a murky and oft duplicitous Cold War netherworld–one filled with quirky and amoral operatives whose motivations are rarely entirely humane–with his principles intact. Facing patriotic outrage at home due to his above-and-beyond approach to defending an accused Russian spy and, later, the competing objectives of the CIA, the KGB and the German Democratic Republic in Berlin, Hanks’ character still manages to come out resolute and as blameless as a lamb, without a shred of ambiguity, which could have become tedious without the actor’s considerable charm and the implicit trust of an adoring audience. In short, his performance is about as Hanks-ian as they come. As good as Hanks is, though, he’s nearly outshone in scenes he shares with Mark Raylance, who portrays Abel with a quiet, warm decency that belies the expectations of a someone in his occupation and circumstance. One of the film’s most effective repeating jokes, in fact, involves Raylance’s lack of exasperation when faced with exponentially escalating troubles. Even moreso than with captured American Gary Powers (played by Austin Stonewell), with whom the sympathies of U.S. audience should naturally lie, we come to empathize with Abel–a testament to the camaraderie between Hanks and Raylance and both actors’ depiction of an undeniable, shared humanity. 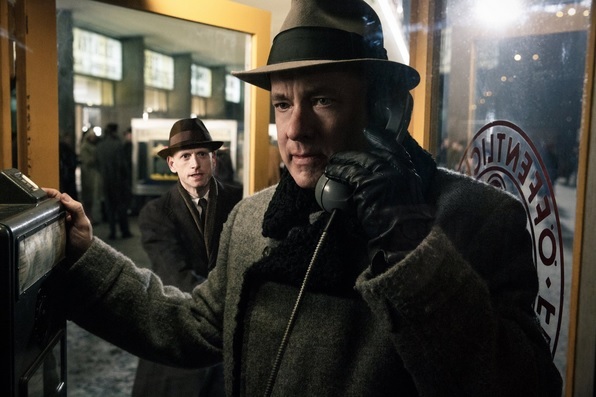 Beyond these performances, Bridge of Spies is a wonder of production design and art direction, its backdrops ranging from a nostalgic late 50’s Brooklyn to the chill and paranoia of early Cold War-era Berlin. Coated in a heavy gloss of cinematographer Janus Kaminski’s signature spiritual gauze, the film’s widescreen urban vistas are utterly transporting. Noteworthy, too, are scenes of humorous supporting-character quirk, a clear watermark of Joel and Ethan Coen’s contributions to the script. The problem–not so surprisingly, overall–is that all of the film’s fine craftsmanship and performance is in service of a story with little heavy drama or suspense. While a few of the Berlin sequences manage to ratchet up a smidge of tension, there’s never so much as a moment’s doubt that everything will turn out fine for our principles–something that may just be an inherent flaw of “inspired by true events”-films, especially when directed by Stephen “Uplifting” Spielberg and starring Tom “Nice Guy” Hanks. Exacerbating that feeling somewhat is Thomas Newman’s overtly saccharin score, which, for the most part, is mercifully unobtrusive and ultimately forgettable. Overall, the result of this mixture of elements is an impeccably produced and performed, breezy piece of entertainment that’s unlikely to stick in the mind once the credits roll. To draw from Spielberg’s vast and varied oeuvre, it’s like Catch Me If You Can but with a fraction of the wit and spark and none of the thrills, or Lincoln sans the historical importance. But ultimately, while Bridge of Spies may fall short of being essential viewing, it still comes highly recommended. Shaun McAllister is an NYC expatriate currently exiled in the wastes of rural Georgia. These are his desperate cultural dispatches from his hellish sentence amongst the hill people.